Do you feel the need to optimize your website content to add to the marketing campaign? 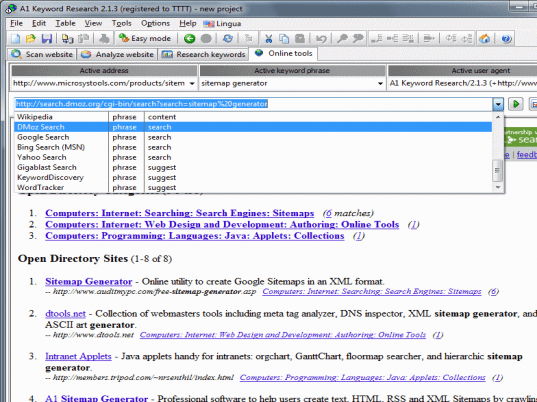 Why don’t you opt for the A1 Keyword Research 1.0.5 software that allows you to find the related keywords and the relevant phrases? You will just have to build your keyword list that will cover all the variations of the word and A1 Keyword Research 1.0.5 software will take over and help you reduce your burden. The software appears with a decent grey, white and blue background. On the left hand side you are provided with the site map that contains the path, items as well as the title. Supposing if you want to add something to the quick list then type that word in the blank space that is given at the bottom and then you click on the cross that Is given beside it with which you can add it to the quick list. You can also edit with the next option that is given or if you want you can even choose from the quick list. If you want to scan a website then you simply have to click on the option Scan Website or you can even analyze the website by clicking on the Analyze website option and then the result would appear in a very short period of time. You can also see the collected data as you are also provided with the Collected Data option, you can view the file as well as the source. All the necessary modifications are to be done on the left hand side and then you have to scan it and the result will appear on the right hand side. after finding all the related keywords and phrases and after scanning all that you require you simply need to save the file by going to the File option that is given at the top and then clicking on the Save As option. The software has been awarded a rating of 3 as even though it is a bit complicated, since the overall result are effective. So get this utility and take your advertisement campaign to a new level.